The 64-year-old musician advised the 53-year-old singer - who is set to sing her new song Give Me All Your Luvin at the Super Bowl in February - to, "Make sure you lip-synch good". 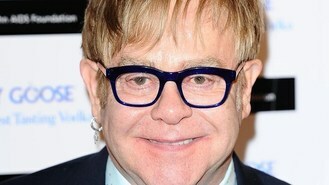 Elton spoke to Good Morning America about the half time show, saying: "I've never seen a decent one. Never ever. You have to play live, but I don't think you can. "In all fairness to everyone who's done one before, you may be able to sing live, but it's really hard to play live." Paul McCartney, The Rolling Stones and Bruce Springsteen are among previous performers in the spot. Meanwhile, Madonna has claimed her infamous raunchy performance of Like A Virgin at the 1984 Video Music Awards was all an accident. The 53-year-old singer looked back on the 1984 performance ahead of the Superbowl on Tonight's Jay Leno show, and insisted she didn't mean to flash her underwear. Madonna said: "Here's what happened. I was standing at the top of a wedding cake, as one does, and I walked down these steps, which were the tiers of a wedding cake. "So I thought well, I'll just pretend I meant to do this and I dove on to the floor and I rolled around and I reached for the shoe. And as I reached for the shoe, the dress went up. And the underpants were showing... I didn't mean to."